Featuring the No. 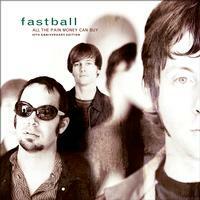 1 Modern Rock Hit "The Way"
When the first single from Fastball's second record was released a few months before the album dropped, it was apparent there would be no sophomore slump. "The Way" exploded at radio, eventually going Gold, and propelling All The Pain Money Can Buy to Gold status in only three months and platinum another three months later. The release also received two Grammy nominations, and the band won four Austin Chronicle awards for the album. Produced by the band with Julian Raymond (Cheap Trick, Sugarland, LP), All The Pain That Money Can Buy also delivered the Top 20 single "Out Of My Head" (whose chorus was recently reinterpreted in "Bad Things" by Machine Gun Kelly & Camilla Cabello) while also including a track with Poe (whose Hello was certified gold in 1996). This 20th Anniversary Edition contains the original 13 songs, plus 9 bonus tracks including rare B-sides, compilation tracks, and four previously unissued demos. To make this anniversary even more special, the album makes its vinyl debut as a double LP containing all of the bonus material!